As the test build for this boat is coming together it is giving me more thinking time which can be a dangerous thing for me. Designing is my first love in model boats and leaving an idea alone is hard for me! I have now drawn the templates for the new sails and I have increased the area to be more in line with that of the ‘Siren’ design. The main sail shape will now be like the ‘Pond Sprite’ with the curved entry leach top and bottom. This shape works well without battens which has it’s advantages. Whilst thinking about the sails I saw a simple way to take advantage of the carbon fibre jib luff without the full ‘loose topped’ system which I designed for the Siren and Pond Sprite. I will incorportate that idea into the kit. The original area and shape sails will still be avalable for those who wish to have a similar boat to an existing club fleet. So far the other change has been to add 3/4″ depth to the keel fin. Since the original Kittiwake all of my fins have been deeper so I saw no reason not to make that change to the Kittiwake II also. 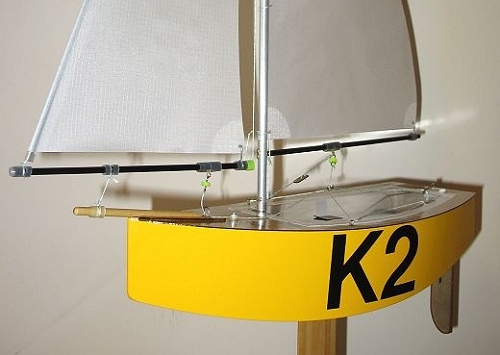 With the changes in place I expect the new Kittiwake to be a more competitive boat in Footy racing. 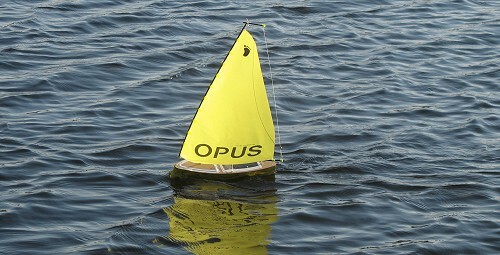 The original design was not intended to be a race boat, rather it was a small good handling and easy to build introductory RC yacht. But many Kittiwakes have found their way into racing fleets so my aim now is to make it into a more competitive boat without sacrificing the other attributes which have made it such a popular boat. Photos soon when I have made enough progress for you to see the difference. Over the weekend we had two grand daughters staying with us so they had their first taste of model sailing and appeared to really enjoy it. What I do love about model sailboats is that it is so easy to let a youngster try it. Things happen slowly so as not to be a risk to anyone yet the boats do react well to the controls and give a very obvious sense of accomplishment to the new ‘skipper’. I know our older grand daughter was quite reluctant to give it up so maybe her sailing career is worth persuing! It was a beautiful day in the mid 70’s with a nice steady breeze to sail in and keep us cool. I have flown model aircraft for many years but I have to say that doesn’t come close to the fun and relaxation to be found at the pondside on a lovely summer day. Sharing the fun with family too really adds to the pleasure. Find yourself a boat and join in!